KAMPALA – The Uganda National Examinations Board (UNEB) has expressed concern over the continued practice of teachers perpetrating examination malpractice. Speaking at the release of the Primary Leaving Examinations (PLE) that is currently ongoing at the Office of the Prime Minister in Kampala on Thursday, Prof Mary Okwakol, the UNEB board chairperson, said whereas security of exams was better managed this year to eliminate malpractices, challenges remains with teachers helping candidates. She revealed that a case in point is Bundibugyo District wherein 8 schools, teachers were found helping students during exams by reading to them answers in the examination rooms. In these schools, Prof Okwako added that parents were asked to pay Shs50,000 each for the illegal exercise. 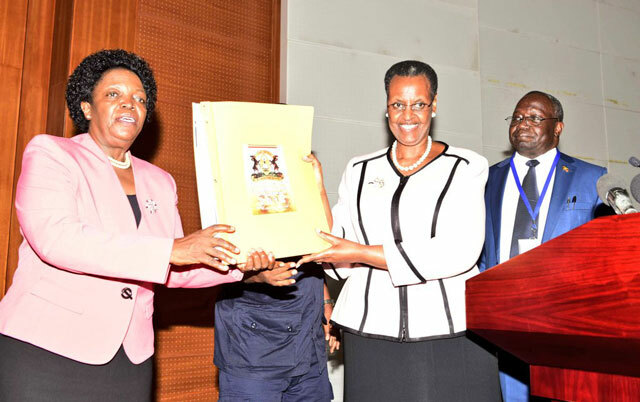 Nevertheless, she revealed that UNEB has set up 300 containers across UNEB centres all over the country to curb malpractice. She said that the Board has set up a legal unit to prosecute cheats and will withhold exams of all those involved in the practice. Inmates and those with special needs as part of UNEB policy on inclusiveness were also catered for. There was an improvement of the online registration of candidates but in the rural areas, there is a challenge, with some schools not aware of the registration status. “Hon Minister, allow me to report to you that some schools that are not registered by the Ministry of Education and Sports continue to operate and dupe parents and learners that they have been registered. “For instance, pupils from Bahrain primary nursery school and primary school in Iganga district and Busenga Junior school and St Peter’s primary school in Butambala District discovered too late that they had not been registered for 2018 PLE,” Prof Okwakol said. Processing of results improved with the use of numbers instead of school names has improved efficiency and an off-site centre will be set up in Jinja for better data management, she said. A total of 671,923 candidates registered to sit PLE at 13,072 centres across the country compared to 646,041 from 12, 751 centres in 2017. This is an increase of 25,882 (3.9) candidates. At least 71% (476,131) of the candidates who sat for the examinations are from government-aided schools, while 29% (195,792) are from private ones.